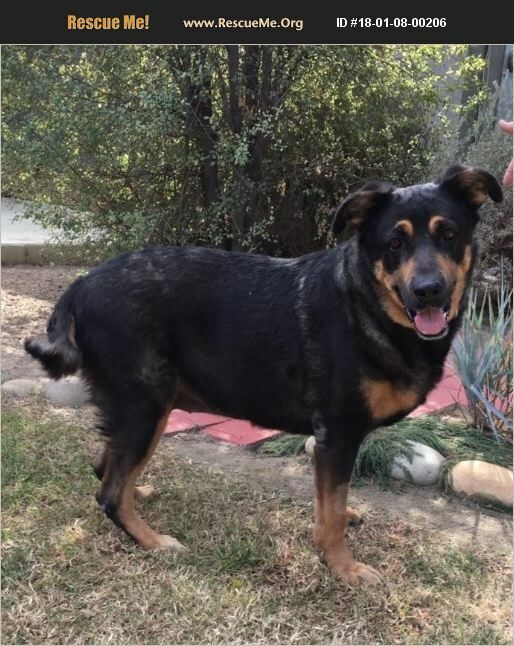 THIS IS A COURTESY POSTING ONLY, IF INTERESTED PLEASE CONTACT WILL AT willnado@gmail.com Age:5- 6 Breed/Weight/Personality: Cookie is a German Shepherd/Rottweiler mix with typical Black and Brown Shepherd markings with a Rottie face and build. She is a 88 pounds of love. Rescue Story: Cookie was a shelter favorite at a Los Angeles city shelter. Due to overcrowding and limited space, her time was running out. Some kind people from the 'Cookie fan club' reached out to local rescues and sent out SOS emails for a foster home. Cookie was in luck when a kind man agreed to take her in and make her part of the family until a forever home is found. Personality: Cookie is an affectionate girl who is very people oriented, enjoying human interaction and attention whenever possible. She craves the human touch and will follow her foster dad around like a puppy. She is a people pleaser and minds her manners inside the home never daring to chew or destroy furniture. Cookie is impeccably well behaved knowing not to jump on people or furniture as well as being housebroken. She can hold it for several hours until her foster daddy comes home to take her on her beloved walks. The jingle of a leash sends Cookie into a happy dance as she prances and hops around in circles eager to go out on her daily stroll. Initially she is so excited to be on her walk that she leads her foster dad to go faster and faster but eventually she calms down nicely after that and calmly walks by his side. Mostly she is a yard lounger and likes to take in the outdoors rather than be cooped up in a house all day. She is a squirrel chaser so seeing those pesky little guys does elicit a few barks and an attempted chase. On her daily walks, she is pretty oblivious to other dogs, big or small, and is just enjoying every moment of her stroll around the neighborhood. It is almost comical to follow behind her as she walks, with ears flapping and a waddle-like stride. When she encounters a human, her signature move is to stop for some pets and love. Cookie is a sucker for pets behind the ears. She is not a fussy or ravenous eater; once a day is fine with her. However, she is a copious drinker of water, sometimes as much as 60 gulps at once. Cookie's favorite game to play with her foster dad is fetch with the ball - except she has put her own twist on it and once she fetches the ball she wants you to chase her! What a silly and happy girl. Another favorite past time of Cookie's is to gnaw on a yummy marrow bone - that can keep her occupied for quite a while. At night Cookie sleeps in the family room of her foster home since she does snoar rather loudly. Medical: Cookie is spayed, up to date on vaccines, micro chipped. Cookie does take a very inexpensive ($15/month) thyroid pill 2x daily. Would do best: Cookie would do best in an adult home with or without older kids - as long as she is showered with love and attention. She is a people dog! Cookie wants to be where the people are and get belly rubs and neck pets whenever, wherever possible. She isn't overly active so she can be with someone who works as long as she got at least one or two good walks in a day along with some yard time. Cats/Dogs/Kids: Cookie is way more into people that dogs so we would venture to say she is fine with dogs but does not engage with them a whole lot. She definitely is not aggressive towards them and can coexist with any other family dog, big or small. She is kind and gentle with children. Cookie does chase cats so a non-cat home is best.